As SOAS marks Black History Month we continue to hi-light historical collections held by SOAS Archives, which reveal the long-standing Black presence in the UK, as well as the contributions and achievements of Black peoples in local, national and international arenas. 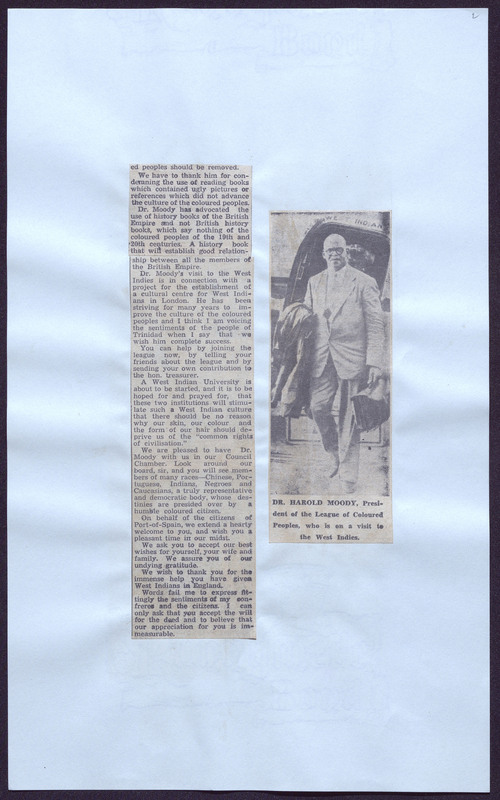 This week we look at papers relating to Harold Moody (1882-1947), founder and President of the League of Coloured Peoples and active social campaigner for black migrants in London in the 1930s and 1940s. Harold Moody was born in Kingston, Jamaica, in 1882, the eldest son of a prosperous retail chemist and strict Congregationalist . In 1904 he came to the UK to study medicine at King’s College, London. Having been refused work because of his colour, he set up his own successful medical practice in Peckham in February 1913. Motivated by his personal experiences of racial prejudice, in March 1931 he formed the League of Coloured Peoples, which was concerned with racial equality and civil rights in Britain and elsewhere in the world. He served as the League’s President until his death in 1947. He also campaigned against racial prejudice in the armed forces, and is credited with overturning the Special Restriction Order (or Coloured Seamen’s Act) of 1925, a discriminatory measure that sought to provide subsidies to merchant shipping employing only British nationals and required ‘alien seamen’ (many of whom had served the UK during the First World War) to register with their local police. Many black and Asian British nationals had no proof of identity and were made redundant. A devout Christian, Harold Moody was active in the Congregational Union, the Colonial Missionary Society (of which he was elected Chairman in 1921) and later, the Christian Endeavour Union (from 1936). 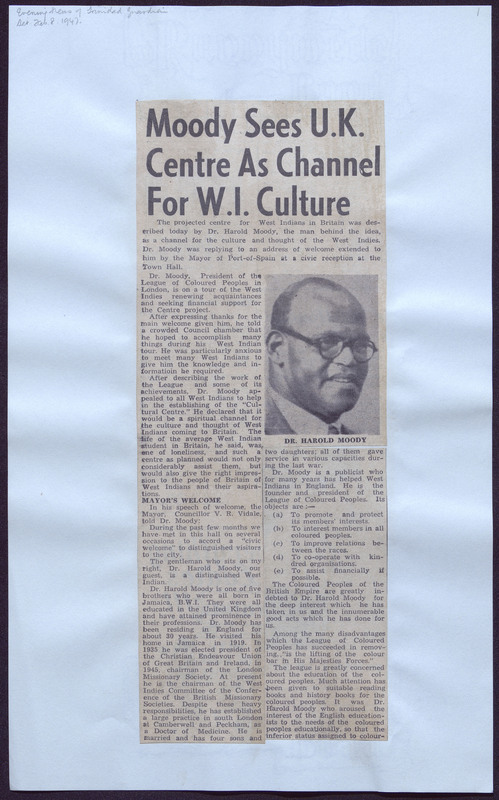 Moody’s connection with the Colonial Missionary Society (renamed the Commonwealth Missionary Society in 1956), can be seen in the archives of that Society, which are held at SOAS Library. Papers include a report on the ‘Present condition and present need of Congregational Churches in Jamaica, Summer 1912’, and much later, press cuttings relating to a visit to Jamaica made by Moody in 1947, the aim of which was partly to launch an appeal for funds with a view to founding a cultural centre for West Indians in London (Ref: CWM/LMS/Jamaica/Subject Files, Box 1). Moody became ill during this visit and died only 10 days after his return. Cutting from Evening News of Trinidad Guardian, 1947. Ref: CWM/CMS/Jamaica/Subject Files, Box 1. Council for World Mission Archive. 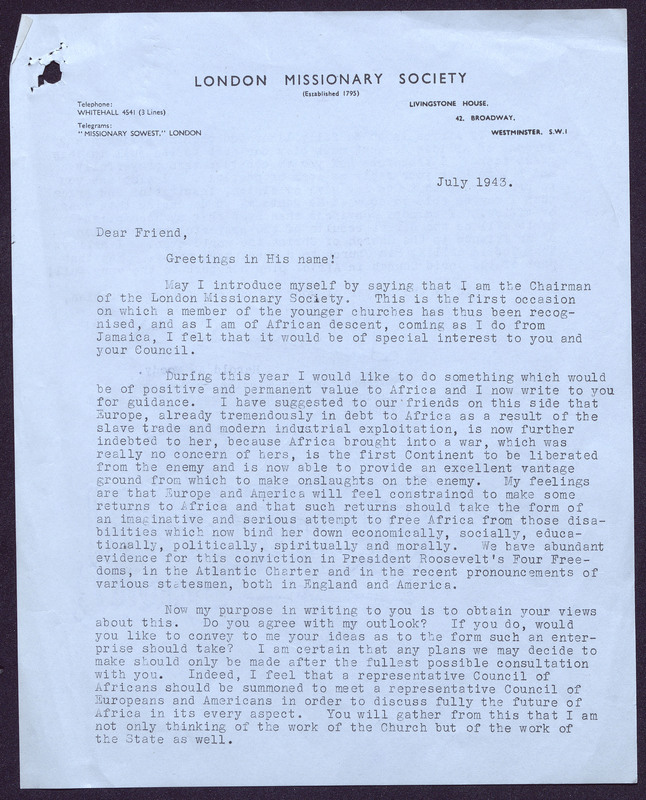 Another interesting letter from Harold Moody found with the archives of the London Missionary Society, dating from July 1943, is written in his capacity as President of the League of Coloured Peoples, and invites a discussion between a representative Council of Africans and a representative Council of Europeans and Americans on the future of Africa. The letter was sent out to prominent African figures, a list being attached to the letter (Ref: CWM/LMS/1941-1959/Box AF/19). 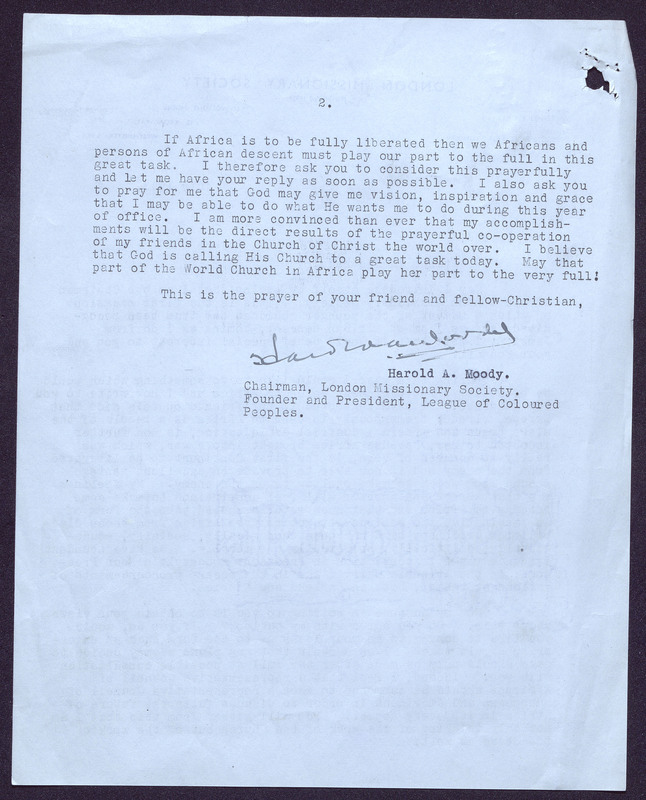 ‘Letter to African Leaders’, written by Harold A. Moody, July 1943. Ref: CWM/LMS/1941-1950/Box AF/19. Copyright Council for World Mission. Papers can be seen in the Special Collections Reading Room, SOAS Library. Additional material relating to Harold Moody can be found at The National Archives and the Black Cultural Archives.